Look deep into heritage, and then you will understand everything better. THIS KUL CITY kicked-off with a bang on Saturday, 25 April 2015 with our very first walk, ‘THIS KUL CITY: DISCOVER BUKIT NANAS’! Close to 200 people joined this discovery walk around Bukit Nanas, exploring the historical landmarks along the route and walking through Kuala Lumpur’s only surviving virgin forest, the Bukit Nanas Forest Reserve. The walk started at Muzium Telekom. 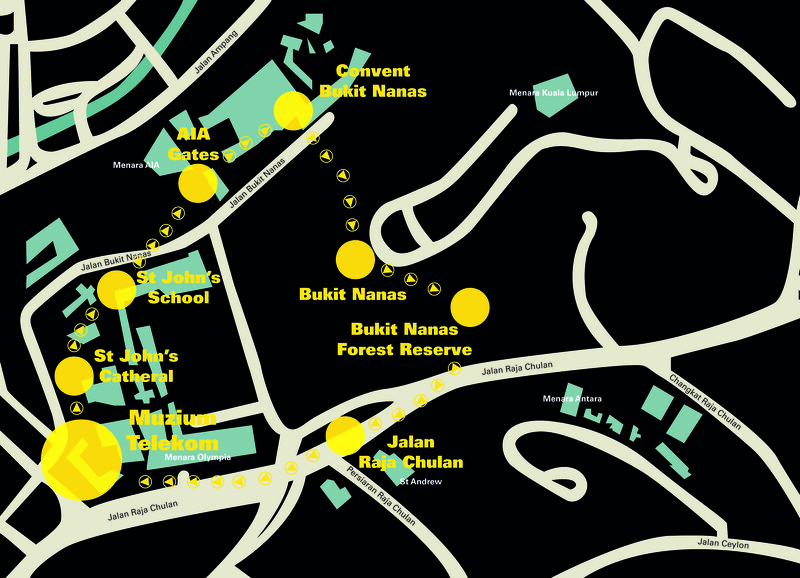 From there, participants made their way to the St. John’s Cathedral, the St. John’s Institution, AIA Gates, Convent Bukit Nanas and entered the Forest Reserve and made their way through the reserve, reading the landmark buntings there and visited the Forest Reserve office which had an exhibition. After exiting the Forest Reserve, participants then passed through Jalan Raja Chulan and ended their walk at the Museum again. THIS KUL CITY: DISCOVER BUKIT NANAS provided the opportunity for many participants to visit and explore these historical landmarks which they have never visited or known about before. Feedback received from the participants were positive and engaging, with many saying they were thrilled to visit the different places on the route. To top it off, the free access to Muzium Telekom’s Gallery was an added bonus for the participants. GO ON YOUR OWN DISCOVERY! The launch Ilse Noor’s book, Warisan Nusa: Malaysian Cultural Heritage, happens tomorrow 11AM at Badan Warisan. The intimate storytelling of her visits to heritage buildings of Malaysia, accompanied by her intricate etchings of them, truly impart the sense and spirit of her subjects. You should definitely come hear her speak and celebrate the work with us. ✨ Link in bio. Badan Warisan’s President, Elizabeth Cardosa, standing in front of No. 2, Jalan Stonor. Wet-Plate Collodion Process Dr. K. Azril Ismail • 2019 The demonstration this Saturday was a huge success! A huge thank you to Dr. Azril (@agno3solution ) and everyone who joined us. Make sure to follow us on Facebook at @heritagemalaysia to be updated on more exciting events. Examples of three main shophouse styles in Southern Johor: → Traditional early 20th century style → Early modern style (circa 1970s) →Simplistic mid 20th century style Just two more days til our public lecture about how a group of planners researched the history, nature, and culture to inform their work. Click the link in our bio! We will be closed this Saturday, as we take a trip to Seri Menanti and Paroi to see the Istana Lama and relocated Salinger House. Jomlah cuci mata dan makan angin dengan kami 🙋🏻‍♀🙋🏽‍♂ It's the last day to register! 👉🏻 Click the link in our bio to register!